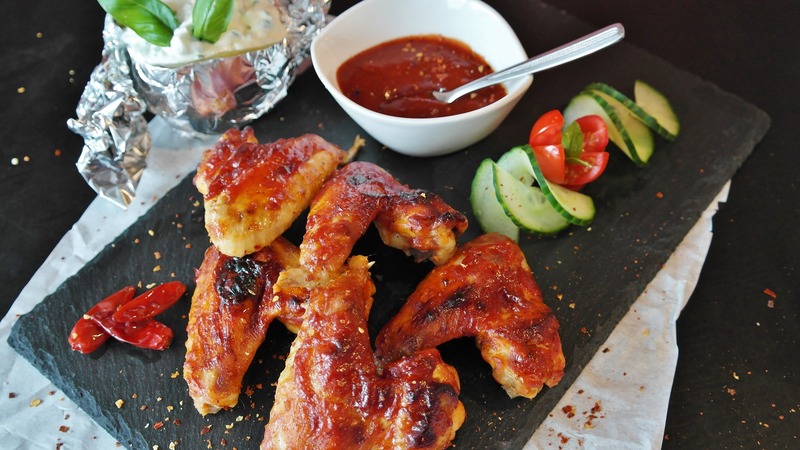 Healthy Homemade HONEY-GINGER BBQ SAUCE - your family will love! 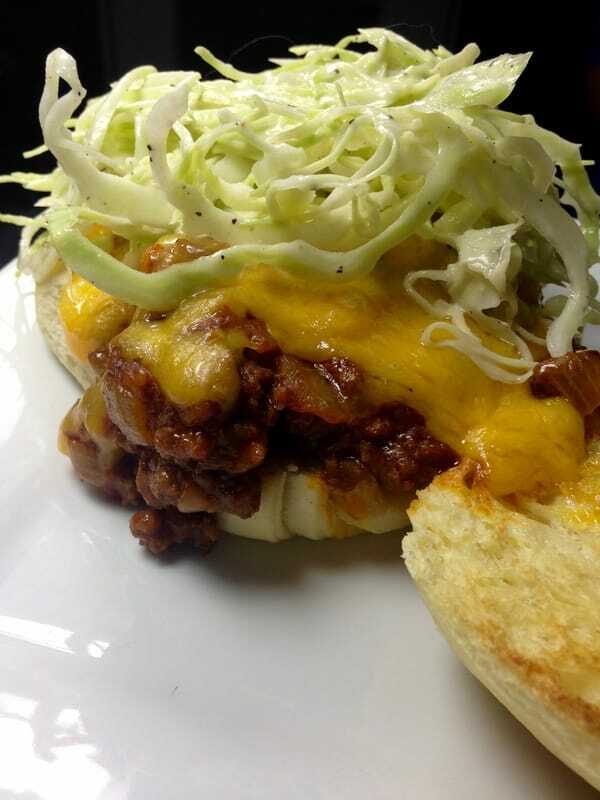 3 Homemade Delicious Sloppy Joes for Super Bowl! IT’S THAT TIME AGAIN! 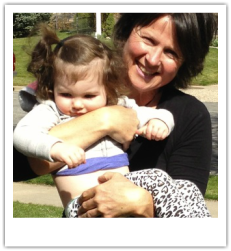 Tender thoughts of the Game, Family, Friends and….. FOOD! My flood-torn new kitchen is ALMOST FINISHED! 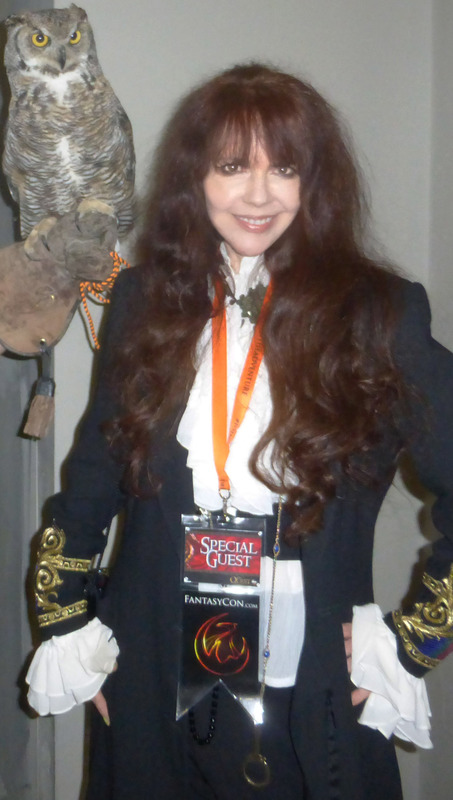 For now, I am once again showcasing my invited guest, foodie extraordinaire, Jean Broom! I’m including here, two of Jean’s yummy homemade versions. Use the Honey Ginger BBQ Sauce for a Vegetarian version (my fave style) and you have three options! Toast up a ton of the crusty bread and have three versions available and all your giddy fans with be in Football-heaven. Bring all ingredients to a boil and turn down to medium low and cook, stirring occasionally, for about 20 minutes. If you prefer a smooth sauce, you could blend this in a blender or with a hand blender. I like it chunky. It can then be stored in the fridge for up to a month. I like to mix it with poached chicken, which has been shredded. I can find numerous uses for the chicken one of which is to put it on pizzas, along with peppers, onions and mushrooms. or on a heated bun with a bit of shredded cabbage, hint of onion and a dab of mayonnaise for a great family friendly dinner, or for a game day…like the Super Bowl or simply brush it on baking chicken pieces the last few minutes of cooking time. *Shoa Xing is a Chinese cooking wine that I like to use in sauces and stir fries. If you would rather use something that’s alcohol free, there is a product called *Fre that’s an alcohol free wine that comes in both red and white. Or alternatively you could use an unsweetened red grape juice. Put either boneless skinless or bone-in chicken breasts or thighs into a pot with enough water to just barely cover the chicken. Bring to a boil, cover and turn down to medium low and cook till the meat is cooked through and there is no more pink in the middle, about 15-20 minutes, a little longer if using bone-in. An onion, a piece of celery and half a carrot could be added to the water before bringing to a boil, to give more flavor to the meat and broth. 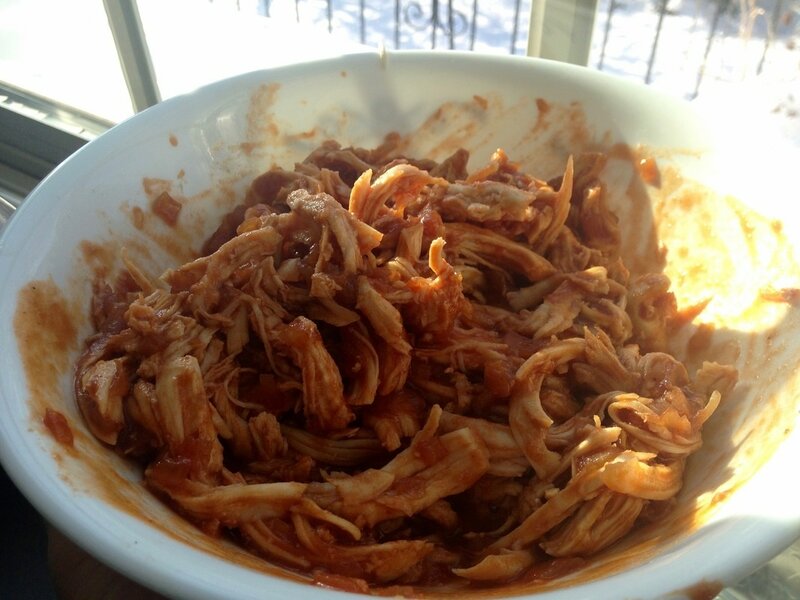 Let the chicken cool slightly and shred chicken with your hands or pulling apart with two forks. Add desired amount of barbecue sauce to the meat. Strain the chunks from the broth and save for a future use. ( I like to put mine in a freezer bag for when I make soup ). Spoon over Crusty Bread toasted with Olive Oil. Cover and cook over medium-low heat while you prepare the rolls, cheese and cabbage. Cut open 12 hamburger like rolls. Lay them on a cookie sheet and preheat oven to broil. On a mandolin or with a sharp knife, thinly slice enough cabbage to use on top of sloppy joes. For me, this depends on who at my table will want the cabbage. Scoop a spoonful of mayonaise into bowl with cabbage ( or directly onto cabbage on cutting board ) with a squeeze of lemon juice and a sprinkling of salt and pepper. Mix with your hands and set aside. 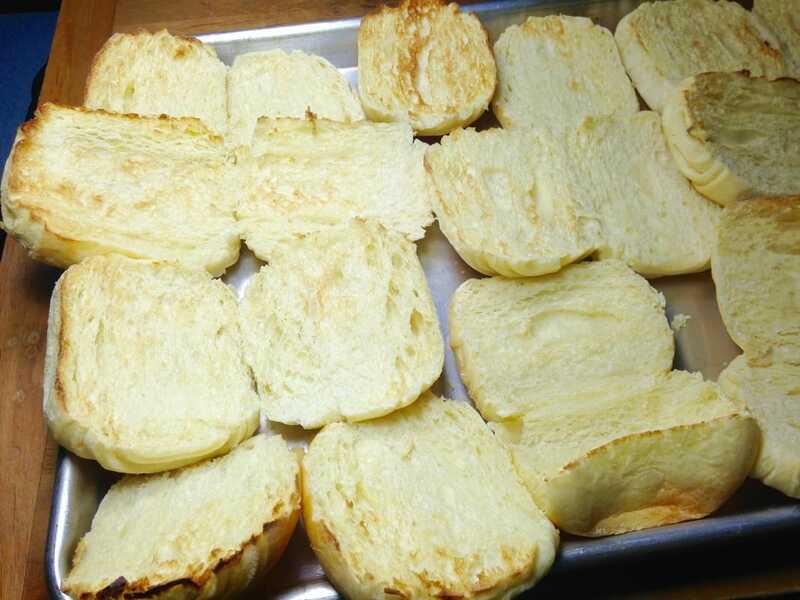 Put rolls under the broiler until just lightly golden. Remove from oven and scoop meat on one-half of a roll, cover with cheese and put the pan back into the oven until the cheese is melted. Put as much cabbage on top of melted cheese as you wish and serve. You could add other toppings such as mayonaise, sliced tomato, shredded lettuce, pickled jalapenos, pickles and whatever else you’d like. Note: I’m not a huge believer in prepackaged and processed foods, but in this instance, I make an exception. The kids love this dish and adding the cabbage slaw makes me feel better because I’m getting some vegetables into the dinner. You could use an already shredded bagged cabbage in place of slicing your own. This is such an easy and quick dish to throw together on a busy Holiday evening. Just keep some rolls frozen for such an occasion. They will thaw enough to broil in the time you brown the meat. Turkey would also work well instead of the beef. 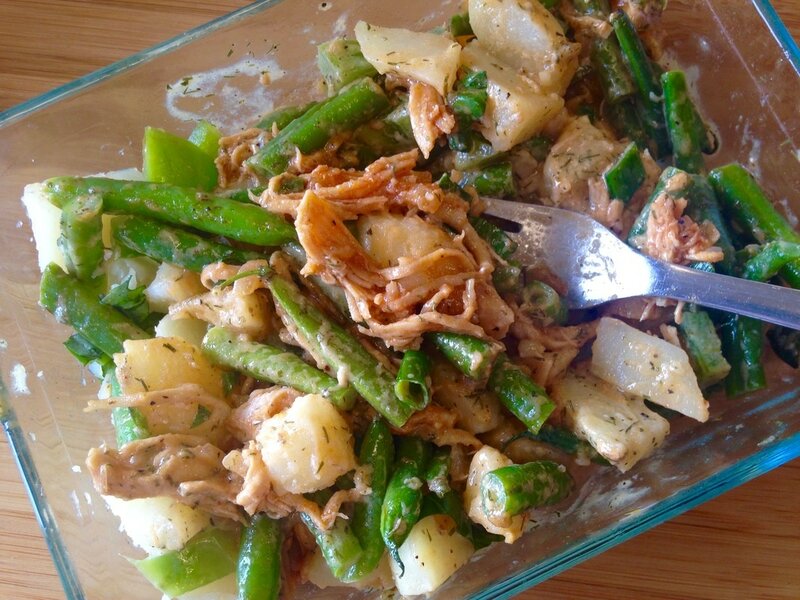 This was one of the things I used the Shredded Chicken with Barbecue Sauce for……A potato salad I took for lunch with green beans, green onions, green pepper, fresh basil dressed in dill-spiked mayo with a touch of apple cider vinegar, olive oil and dijon mustard. Visit Gregory’s Wheatshop in Bountiful, Utah to learn about and Sign Up for her awesome classes! She has a fun VALENTINE’S KIDS’ COOKING CLASS coming up FEB 10! Watch for more details on their page, Mon, Feb 6. 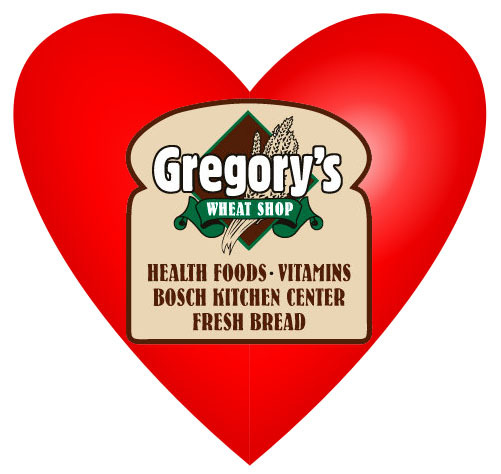 Gregory’s Wheatshop has a wide range of healthful, organic supplements, cooking food supplies, utensils and small appliances that are exactly what you need for all your Foodie Dreams! I am a fan of everything and everyone Gregory’s! I created and run their FB page! I hope you will also SUBSCRIBE! 2017 Ground Hog Day! Snow Boots or Cherry Blossoms? Non-toxic Spackle Paste & Putty! Low VOC & much More!